Almotamar.net - Anxiety is affecting many Yemeni girls who are groaning under the burden of economic problems, which is one of the primary motivations for child marriage in the country. Mohammed Ali, a father of five daughters, said that he was fired from his job three years ago, and lost the income needed to provide them with a good education and comfortable life. 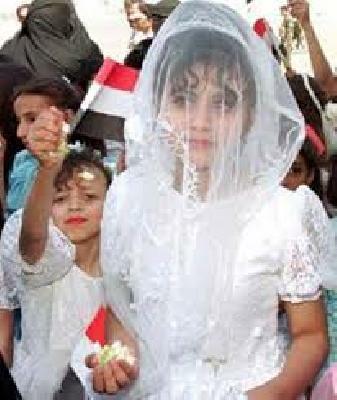 Academic studies say that 52% of Yemeni girls accept marriage in their early years to escape poverty. The study also said that boys are also affected by the phenomenon. Yemen’s Personal Status Law of 1994 sets the minimum age of marriage at 15 years, but official sources say that amendments have made it ambiguous and unclear. The current law states that only a girl’s trustee has the right to decide whether she is ready for marriage, which greatly affects the government’s ability to act on the issue. In 2013, the National Dialogue Conference came up with a new law that fixed the age of marriage at 18 years. Activist Shata al-Harazi says that the new marriage age is a landmark achievement for Yemeni women. Hind Nasiri said that the National Campaign against Underage Marriage recently started a field visit to aware people of the underage marriage and awareness of constitutional laws in order to NDC outputs. Teacher Samia Ali agreed, though, that although the new constitution should include a law of marriage age, poverty needs to be addressed to seriously tackle the problem. Early marriage has killed girls all across Yemen, regardless of the reasons why. Dr. Zianb al-Kazzan, an obstetrician, said that most of girls who marry during childhood experience severe bleeding on the first day of their marriage. Also, her small body size is unprepared for pregnancy, which is a fatal risk for her and her children. Early marriage can also cause severe psychological problems. Dr. Ebtsam Zaid, a psychologist, said that the girl who marry underage often suffer from depression and anxiety. Underage brides are also prone to increased mental and psychological pressure, due to their inability to deal with the complex issues of marital relations and motherhood. Ultimately, this leads to women being deprived of their childhood. Huda, a teacher, said that it hurts her when girls drop out of school to marry. Amal al-Basha is widely considered to be the first Yemeni to call for a law determining the age of marriage. Al-Basha said that the aim of marriage is building a family, but what is happening in Yemen does not fit this definition. This is not marriage, she says; it is a violation of childhood.